Express Invoice offers everything you need to control your expenses, receipts, keep track of your inventory, customers and suppliers, and deal with the whole issue of billing and generate detailed reports. Ideal for small- to medium-sized businesses doing their own accounting, Express Invoice is a professional package which allows you to keep a database of your customers and suppliers, create invoices and send them by email or fax from the application. Express Invoice also allows you to remotely access the program from anywhere. This means that Express Invoice integrates a web server that, once activated, allows you to connect to your data from any web browser. 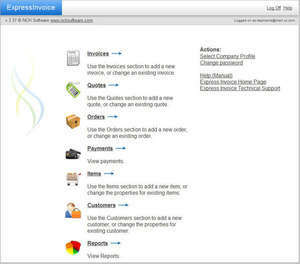 Express Invoice Professional 7.04 is a shareware program and can be used as a demo to try the software until the free trial period has ended. A full version of the program is available after the trial period ends. For security reasons, you should also check out the Express Invoice Professional download at LO4D.com which includes virus and malware tests. Additional screenshots of this application download may be available, too. Express Invoice Professional download been highly rated by our users.